It turns out that in 1912 the mayor of Toyko, Yukio Ozaki, gifted over 3,000 cherry trees to the US, in a number of varieties, and over half (1,800) were of the Yoshino variety. A few may have been distributed around the country, but definitely most of them came to DC (3,020 trees). They were planted in different spots around DC, specifically the now iconic swath of cherry trees that line the Tidal Basin. Roughly two years before, Japan gave a gift of 2,000 trees to the US, arriving in Seattle in late 1909. They arrived in DC in early 2010, infested with insects and diseased, so President Taft ordered them to be burned. Over the years, Japan and the US exchanged more trees and more gifts (Japan to US: Japanese Stone Lantern in 1954 and the Japanese Pagoda in 1958 that also line the Tidal Basin; US to Japan: Dogwood trees). 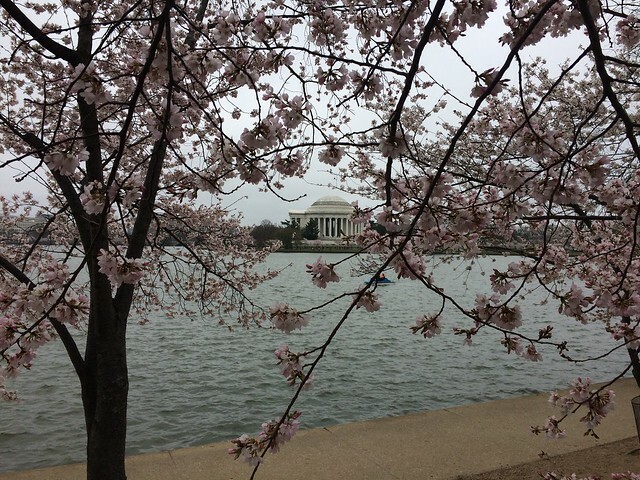 Today there are roughly 3,750 cherry trees around the Tidal Basin. I thought there may be a connection between the cherry trees in Seattle and those in DC, but I haven’t found specific evidence of that. Unfortunately, the trees on the UW campus are old and some are dying, a Yoshino tree has a lifespan of only 60-100 years. The keepers of the trees believe they were young when they were re-planted, and now are probably between 60-70 years old. For more details on the history of the trees in DC, check out the sources below – quite a fascinating journey.